To launch the 70th anniversary year of the Universal Declaration of Human Rights, events and walks were held planet-wide, including this one in Denmark. On 10 December 1948, the United Nations General Assembly adopted the Universal Declaration of Human Rights (UDHR). The historic event was held at the General Assembly’s third session at the Palais de Chaillot in Paris, France. 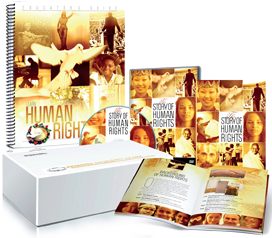 The UDHR is the bedrock upon which the United for Human Rights and Youth for Human Rights campaigns are built. It states the 30 inalienable rights of every human being—most of which are known by very few people. 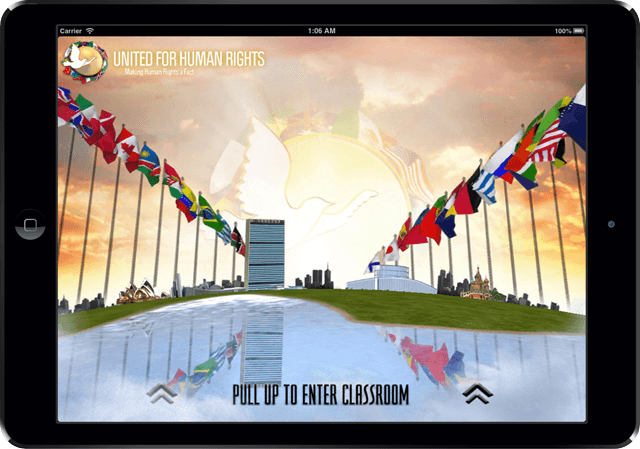 UHR therefore launched the 70th anniversary year on 10 December 2017 with 176 events across 40 countries, in 104 cities. These spanned the globe, from Australia to India and Iraq, and from Cameroon and Ghana, to Denmark, France and Greece; then from Canada and the US, down to Haiti, Mexico and Peru and back across the Pacific to New Zealand, with many other countries in between. In Cameroon, the UHR team was invited by the National Commission for Human Rights and Freedom to their launch event, a two-day human rights exhibition. The team then held human rights seminars for 2,000 students in four schools. Due southeast in Kenya, the human rights team delivered seminars at the Pandipieri KUAP children center and the Mama Ngina Children’s Home. In Morocco, the Bab al Gharbi historical monument in Oujda City was the event venue, where citizens signed a petition to make human rights education mandatory. In Sydney, a radio show aired on indigenous radio station Sydney Koori, enlightening listeners on their rights. Far north from the Australian summer, in Canada’s winter snow, Toronto’s UHR volunteers hosted an event at the Ontario Science Centre. They also participated in the York Regional Police Citizenship Ceremony and Human Rights Day celebration at the invitation of the police superintendent. South to Washington, DC, YHRI was one of the sponsors of the UN Association National Capital Area Human Rights Day event, where the UN High Commissioner on Human Rights spoke. The UHR chapter’s event in Nashville, Tennessee, was held in partnership with the Tennessee Human Rights Commission, Metro Human Relations Commission, Amnesty International and the United Nations Association. The chapter also received proclamations from both the Nashville Mayor and the Tennessee Governor. In Mexico City, YHR Mexico partnered with the Collective Transportation System, which released 20 million commemorative metro tickets promoting the UDHR. In Ecuador a series of training sessions was delivered to the National Police. Back across the Atlantic, European events included one in Denmark with a Walk for Human Rights led by students and teachers; a petition drive by YHR Spain and the Association FOARE, a nonprofit specializing in assisting refugees find their feet and learn their rights; and in Budapest, Hungary, a Human Rights Walk with 1,600 people. In Italy, groups held events in Brescia, Florence, Cagliari, Novara and Verona. Milano had its own Human Rights Walk through the city, and in Torino two Evangelical African churches participated. It was indeed a historic celebration of the 70th anniversary of the UDHR with fanfare across the globe.